One Visit Will Explain Why It's "The National"
It's coming. The 25th National Sports Collectors Convention, or simply "The National", is the largest sports and collectibles show in the world. In fact, it's been said, "If you can't find what you're looking for at the National, it probably doesn't exist!" The National is the event of the year and is the place you should be in 2004 as collectors, dealers, distributors, manufacturers, licensors and everyone else in the collectibles industry all participate in the world's most spectacular sports and entertainment collectibles industry show. To help you better understand the National and all it involves, I've assembled photographs from the 2001 National held in Cleveland, Ohio - the same location as the 2004 National. Once you look through the photographs and descriptions, you'll likely agree that the National is the right name for this event and if you're only going to make one show this year, then it might as well be the biggest and best. As can be seen here, the floor at the National can provide hours and hours of browsing and fun. 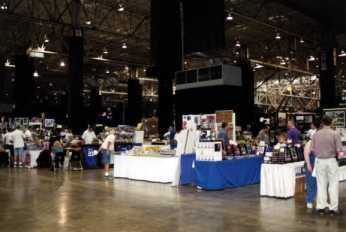 Some of the best dealers from around the world exhibit at the National and the event offers a wide range of sports and entertainment cards and collectibles, toys, event-used equipment, sports and entertainment autographs from athletes and celibrities and more. 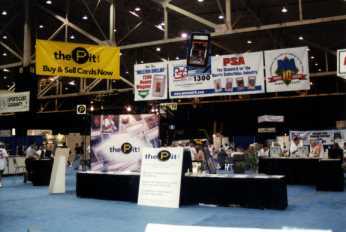 At the 2004 National, over 700 dealers and distributors and 50 corporate displays will utilize over 400,000 sq. ft. of floor space. One day likely won't be enough time to fully take in the National and all that it offers. At the National, many booths not only have items for purchase but also showcase some of the more well-known items in the hobby. For example, the PSA booth at the 2001 National had the hobby's most well-known and expensive baseball card, the $1.265 million PSA NM-MT 8 T206 Honus Wagner, for all collectors to see. 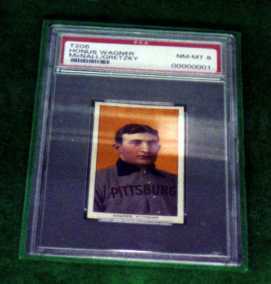 At the 2004 National, PSA and others plan to showcase the largest single display of Wagner cards ever assembled (click here for more details). In addition to a large number of dealers and collectors from around the world, most or all of the leading manufacturers and hobby service providers attend the National. Their presence ranges from booths with free giveaways to autograph sessions to on-site grading of cards. The National is a great place to get to know better the companies and people within the trading card industry and learn just where the hobby is headed. 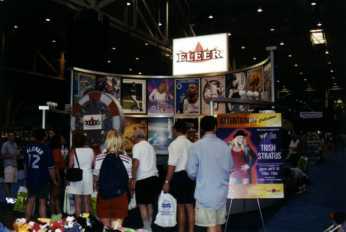 At the 2001 National, the prize wheel at the Fleer booth was a highlight. Each visitor was able to spin the wheel and win different Fleer products. Since many of the products were unopened packs, many collectors enjoyed spinning the wheel and then stepping off to the side to see just how lucky they had been. 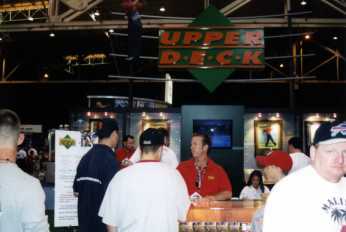 At the 2001 National, one of the most popular booths was the Upper Deck booth. With the pending release of the Upper Deck golf product line, the booth was the site of a large number of special promotions including memorabilia giveaways and free packs of promo golf cards. The "revolving circular line" of collectors walking to get packs every time the Upper Deck staff started handing them out again was something that many kept an eye out for and would drop what they were doing in order to see how many of the packs they could get before the line would stop again. In 1961, Roger Maris' 61st homer broke Babe Ruth's all-time record, but that mark has been passed three times in recent years. Sammy Sosa, Mark McGwire and Barry Bonds have passed beyond the former record with home runs number 66, 70 and 73. 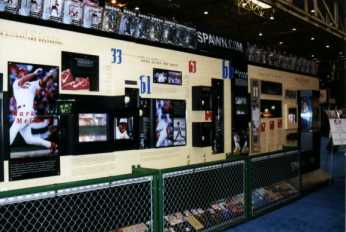 At the 2001 National, the McFarlane Collection was on display to showcase the number 70 ball and nine other McGwire and Sosa 1998 home run balls. Special items like this collection can only be seen in certain places and the National is one of those places. The Traders Speak Collecting Hour radio show was broadcast live throughout the event and there were plenty of giveaways on the last day of the show. In addition, several other collectible and local radio station broadcasts were done live from the floor of the National. This is just one example of the types of things you see at the National that you may just not have known even existed within the hobby. 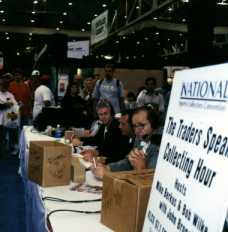 Again in 2004, I and other members of the TCC staff will be attending the National Sports Collectors Convention in Cleveland and will provide extensive coverage of the event. In fact, take a minute now to check out our section devoted entirely to the 2004 National by clicking here. This section will cover the National from start to finish and contain special announcements from around the industry, interviews with some of those that attend and much more. So, be sure to check back often as we'll be providing updates, articles and images leading up to and throughout the show. If you can't be at the National this year, then be at Trading Card Central and we'll do our best to make you feel like you're part of the action at the Silver Anniversary of the National. If you can be there, then look for me. I'll be one of the many collectors walking around looking like they have "died and gone to heaven".